Based in Herefordshire, England, the Helping Hand Company is a long established British Manufacturer. Today, they supply to over 30 countries worldwide. Their core principle behind their product portfolio is to enable customers to live life to the full, making daily tasks a little easier. The company has been manufacturing since 1965. Following a change of ownership in 1988, they further developed their range of aids for daily living and pressure care products. Reachers, scrubbers, leg lifters, and other assistive daily living products made by the Helping Hand Company. Unique sponge designed for cleaning between toes. 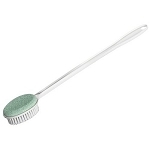 Long handle brush and pumice make scrubbing feet easier for people with arthritis. Long handle foot brush and sponge for people with arthritis who can't reach and bend easily. Ergonomic comfortable grip handle designed for arthritic hands. 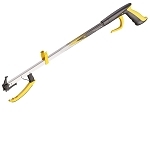 Easy to squeeze trigger with lock and comfortable gel handle.